Primary Consumers - Welcome To The Marine Biome!!! Welcome To The Marine Biome!!! Primary consumer are basically the herbivores of the ocean. 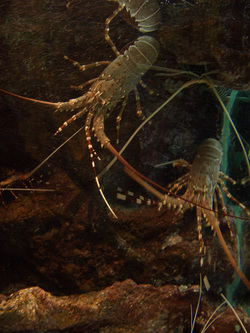 In places like the ocean, the primary consumers are lobster, mussules, and shrimp. Shrimp are still considered primary consumers even though they eat phytoplankton, which are a producer rather than a plant. This is because phytoplankton gets energy from the sun, not plants. You can read more in producers but this is primary consumers. There are many more primary consumers in the ocean but that's what I can think of. You can learn more on other pages.